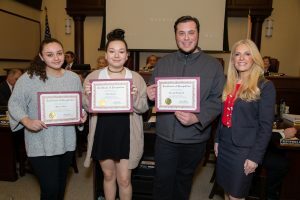 FREEHOLD, NJ – Monmouth County Clerk Christine Giordano Hanlon honored the First, Second, and Third Place Winners of the Inaugural High School Elections and Voting Video Contest at the Monmouth County Board of Chosen Freeholders Meeting on Jan. 24. 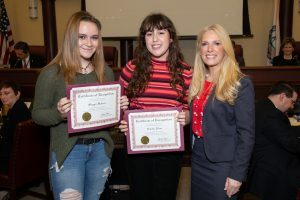 All high school students who reside or attend school in Monmouth County were encouraged to enter the contest by forming groups of no more than three (3) members to enter an original video that emphasized the importance of youth voting participation. The Third Place Winner is Kerry Harper, a senior at Henry Hudson Regional School who received a $75 gift card prize. Under the direction of her teacher, Mr. James Gregg, Kerry’s creative cartoon animated video reminded her peers how young people are historically underrepresented at the polls and how easy it is to register to vote and to make your voice heard. 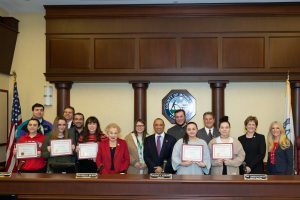 The Inaugural High School Elections and Voting Video Contest hosted by the Monmouth County Clerk’s Office ran from Oct. 17 to Nov. 5. 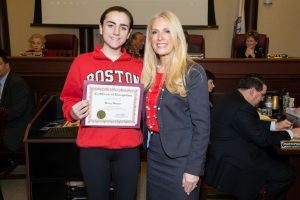 The First, Second, and Third Place Winning Videos will be incorporated into the Monmouth County Clerk’s Office voter outreach campaigns, which includes Clerk Hanlon’s visits to high schools across the County and on the office’s social media platforms and websites. The three videos are available for viewing on the Monmouth County Clerk’s Office YouTube Channel and Facebook Pages. Please visit Facebook.com/MonmouthCountyClerk and click on the “Videos” tab. For questions regarding the Elections and Voting Video Contest, please call 732-431-7324, ext. 8735 or email CountyClerk@co.monmouth.nj.us. 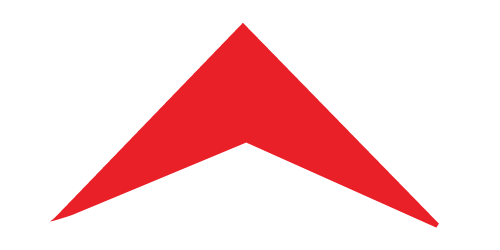 Click here for the downloadable PDF version of this press release.